Vice President Joe Biden decides to fix health care while President Obama is out of the country. Saturday Night Live presents a message from the Vice President of the United States. 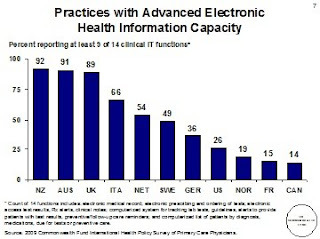 46% of U.S. primary care physicians report using electronic medical records (EMRs) significantly trailing other leading countries. 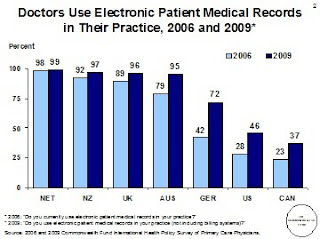 EMRs are "nearly universal" in the Netherlands (99%), New Zealand (97%), the U.K. (96%), Australia (95%), Italy (94%), Norway (97%), and Sweden (94%). The Commonwealth Fund report on A Survey of Primary Care Physicians in 11 Countries, 2009: Perspectives on Care Costs, and Experiences surveyed 10,000 primary care physicians in 11 countries. The findings: the United States lags far behind in terms of access to care, the use of financial incentives to improve the quality of care, and the use of health information technology. The study's authors conclude that "the advanced health information technology and extensive use of quality incentives and care teams reported by Australian, Dutch, and New Zealand doctors reflect national payment and information system policies focused on primary care. Lacking such policies, the U.S. lags far behind its peers in these areas—even as it spends far more on health care overall. In addition, insurance coverage restrictions make it difficult for many U.S. physicians to provide their patients with timely access to care." "We spend far more than any of the other countries in the survey, yet a majority of U.S. primary care doctors say their patients often can’t afford care, and a wide majority of primary care physicians don’t have advanced computer systems to access patient test results, anticipate and avoid medication errors, or support care for chronically ill patients," said Commonwealth Fund Senior Vice President Cathy Schoen, lead author of the article. "The patient-centered chronic care model originated in the U.S., yet other countries are moving forward faster to support care teams including nurses, spending time with patients, and assuring access to after-hours. The study underscores the pressing need for national reforms to close the performance gap to improve outcomes and reduce costs." Seven of eleven countries surveyed had near universal deployment of EMRs and found EMRs with stronger functionality across all sizes of practices. By contrast in the US, more sophisticated EMR deployment was found primarily in larger practices and integrated care systems. 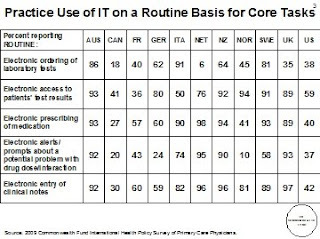 Clinical decision support is not that well developed across any of the countries surveyed. This included low scores for computerized reminders for treatment guidelines, tracking laboratory tests, and prompts to provide patients with test results. 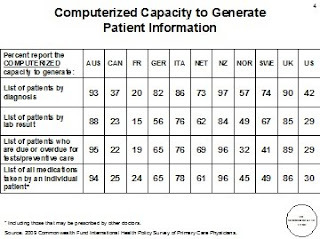 The following are the comparative charts related to health information technology. What are the salient differences in structure for primary care? 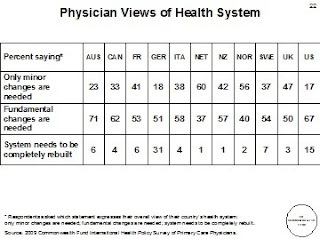 "The United States is distinct in its reliance on internal medicine and pediatrics for primary care and its highly decentralized referral systems. The other countries rely extensively on general or family practice (GP/FP) physicians, often augmented by use of primary care nurses for preventive or chronic care and counseling. 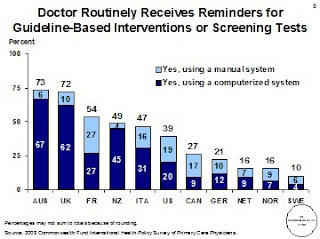 In Australia, Italy, the Netherlands, New Zealand, Norway, and the United Kingdom, patients register with primary care physicians, who typically serve as “gatekeepers” for referral for more specialized care. 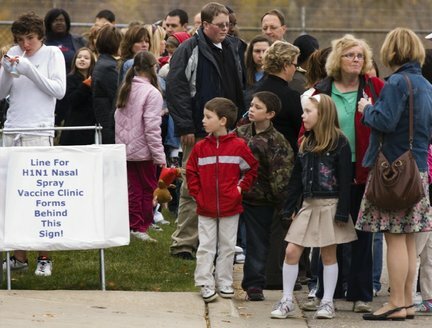 Other countries encourage registration through financial incentives for patients or providers, or both. 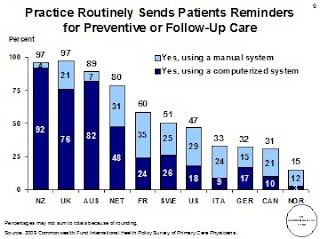 Primary care practices, except in Sweden, generally operate as private practices. A majority of Swedish doctors work as public employees (local health centers), but reforms have been moving to private contracts and a mix of prepayment, or capitation, and fees. Australian, Canadian, French, German, and U.S. insurers generally pay fee-for-service (FFS). The other countries use a blend of capitation and fees for visits, targeted care, or performance incentives. The U.S. system includes examples of salary, mixed FFS and capitation, and integrated systems. Insurance systems differ across countries in patient cost sharing. In contrast to the United States, Canada, the Netherlands, and the United Kingdom have no or little cost sharing for medical care. France requires no cost sharing for specific chronic illnesses. Germany limits costs as a share of income. Norway and Sweden limit annual out-of-pocket costs. In Australia, primary care visits are often “bulkbilled” with no patient charge, and ceilings limit overall cost exposure. New Zealand has been reducing patient fees. Italy’s national benefits cover primary care in full, with copayments for outpatient drugs and specialists." The study found that only the US had not pursued reform of primary care "including financial and information incentives... to provide a foundation for high-quality, efficient care."